Wow what an amazing episode with all kind of emotion. This episode I like most of the season 3 so far. I see things got settled in many ways. Explanation is the answer to all of our questions and after last episode it became very clear to me that this could be an answering episode in many ways. How would Rollo react on the dead of Siggy? Was 'The Wanderer' Harbard Odin or was it someone else? 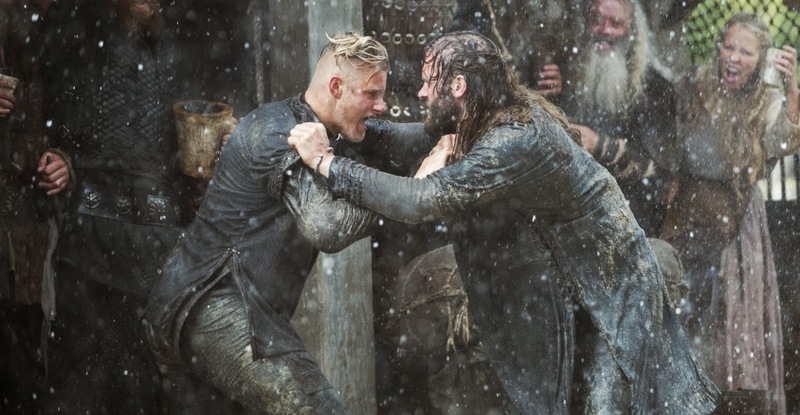 How would Floki think about this happened in Kattegat? Some of you where wondering if Siggy really died last episode. We start with Ragnar, Athelstan and (the jealousy or curiosity) of Floki. I don't know if this is jealousy from Floki I think Floki hates Christianity in many ways. Why wouldn't he be after all he is one of the pagans or the way I like to call him Loki the trickster god bound in a human body. Back to Ragnar and Athelstan, the way Athelstan tells Ragnar about Paris. How he knows that they have great woman and if he had settled there he wouldn't be a monk. Ragnar seems to feel that Athelstan is changing. They talk about marriage, children. If it wasn't for the children Ragnar would leave Kattegat to never return. They welcome everyone back in Kattegat the first thing that happened is that Aslaug tells Ragnar and Rollo what happened to Siggy. The most powerful scene at that moment is that Rollo for the first time is shouting for Siggy. Why where the men so happy back home? How painful it is for him to find out Siggy is gone. At the same moment we see that Ragnar despise Aslaug for leaving the children and poor Helga who think she is doing her best to protect Aslaug and the children for Ragnar. After this something happened the bad habit of Rollo overshadows his well-being. He started to get drunk again. So that is one of his weaknesses but believe me he will conquer and face the truth after he saw the seer. But first he fought with Bjorn he wants to get hurt then he doesn't have to feel the loss. He thinks it is his fold she died. He didn't treat her well. A human dilemma after the hurt she did when meeting with King Horik in season 2. I think Rollo never expected that he went away angry with her. He didn't have a proper goodbye. Sometimes life takes us somewhere unexpected. Bjorn otherwise try to protect Rollo from being killed by the other men. I was happy to see he is willing to do so. Bjorn is one of the many who see something different into Rollo the way Siggy saw, the way Rollo will not see if he stays drunk. So I told you there is a lot of explanation going on in this episode and that brings me to the scene where Floki and Helga are in. Helga tells Floki what really happened between Siggy, Aslaug and the Wanderer Harbard. When Floki hears this he started to think the way I thought. Harbard is Odin. When Helga finished her story about Harbard he tells her he will tell Ragnar. He is protecting her because he knows Ragnar would take advice from him not from Helga. But he also tells her that Siggy been sacrificed for new life. Is Aslaug carrying the new life Floki is telling about or is it pour Judith and Athelstan's child it is referring too. We see both Ragnar and Rollo at the seer. Ragnar if he conquer Paris. Then the seer tells him about a treaty with a princess and a bear. First I tought it would be Bjorn this bear but after a while he told Rollo the same story. So the bear could be Rollo because it is some of his history background. The funny thing here is that he is taking Ragnar the serious way and told him what he wanted to hear. Rollo on the other hand is trying to find out how long he is still alive but in return he is laugh at by the seer. Rollo still thinks he is useless. He is full off anger and tells us what we wanted to know why he is that angry. His father, mother and Lagertha chose Ragnar above him. He failed them and Siggy in a way that is how he feels. Kalf, Kalf, Kalf what have you done, I ask myself. Earl Kalf because you lived there your whole life. Still want to marry Lagertha after you betrayed her. You think she will fall for that? Maybe eventually but for now you where stupid enough to ask. Where are you up to and are you going on an adventure to Paris invited by King Ragnar. I am not sure what to think of you and where was the son of King Horik and wife of Jarl Borg in this episode? Are they really going to show up? What an episode this week I will leave you to find out more next week.